Update January 14, 2014: The game's website is now dead, but the game is not. Stacy Davidson clarified that he killed the website because he'd rather have the game fly under the radar by developing it quietly and then releasing it when it's done, in order to avoid the legal department of Disney. The game can now be followed (and a demo can be downloaded) at this thread on his game development company's forums. Part of being a giddy fan girl revolves around creating and enjoying fan creations that center around the company's creations. I'll admit, I've never been a big Star Wars fan. I just watched part two of the original three all the way through last year, and I've watched bits and pieces of part one and part three. I've also only watched bits and pieces of the new three, and I've never played a Star Wars video game. The bit about me never playing a Star Wars game will change in the near future, however, if Stacy Davidson releases Han Solo Adventures. The game stars Han Solo (played by Harrison Ford in the first three Star Wars movies), and it is set before the events of the original Star Wars movie. There is a clip on YouTube that Stacy created for the Star Wars Uncut project (which gives fans a chance to film 15 seconds of a scene from the original movie, and then the movie will be pieced together from those scenes). The scene in the video below includes voices (because it is a scene from the movie). 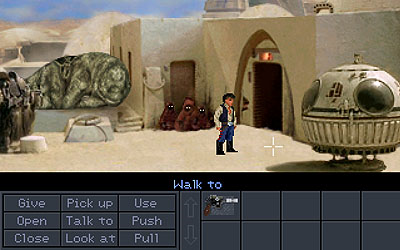 Voice acting will not be included in Han Solo Adventures, it will be purely text like the "non-talkie versions" of LucasArts adventure games from the early 1990s.